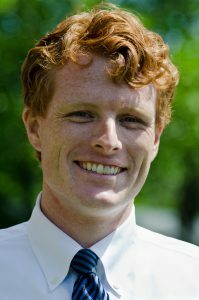 Rep. Joe Kennedy was first elected to Congress in 2012. Since arriving in Washington, Congressman Kennedy has become a standard bearer for progressive causes and a champion of helping fellow progressives get elected to Congress. Congressman Kennedy proudly supports a $15 per hour minimum wage, continues to fight against legalized discrimination against the LGBTQ Community by working to pass the “Do No Harm Act,” and has worked with Congressman John Lewis to advance the “Voter Empowerment Act.” Congressman Kennedy is a rising star in progressive politics, and will continue to advance progressive causes for years to come. He currently serves on the House Committee on Energy and Commerce.